Paal poli recipe also known as paal poori ( milk poli) is a traditional south Indian dessert recipe. 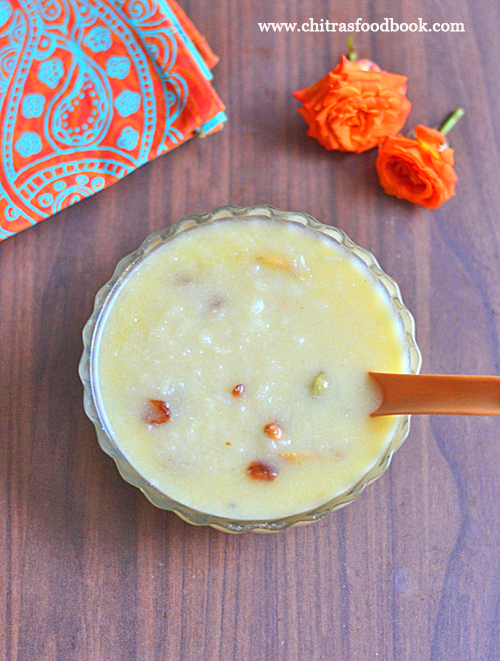 This sweet is prepared with poori and sweetened milk. 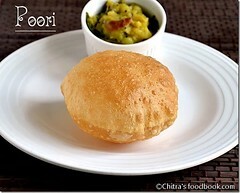 Poori can be prepared with maida / all purpose flour or chiroti rava. Similarly sweetened milk can be made by boiling and reducing the milk adding sugar or by adding condensed milk. 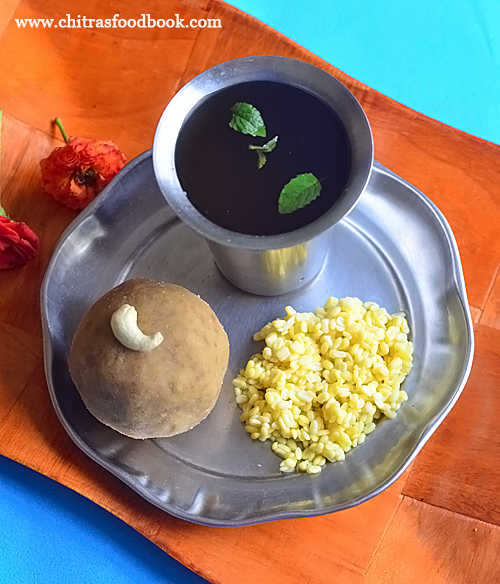 Paal poli is usually served in Tamil brahmins wedding feast. They also make it for festivals like Tamil new year, avani avittam, bhogi and krishna jayanthi. I have tasted this in my friend’s house but she had dipped the maida poori in badam milk. I loved it very much and wanted to try at home. Finally I prepared it for this New year celebration and thought of starting my 2019 recipes with this delicious sweet. As this is my first attempt, I followed an authentic recipe from my cookbook collections. Sendhil loved it very much. I liked it too. Though the procedure seems to be lengthy, it can be prepared easily. Just make maida poori and dunk in sweetened, reduced milk. I served it by garnishing with lots of nuts and saffron for enhanced flavor and taste. 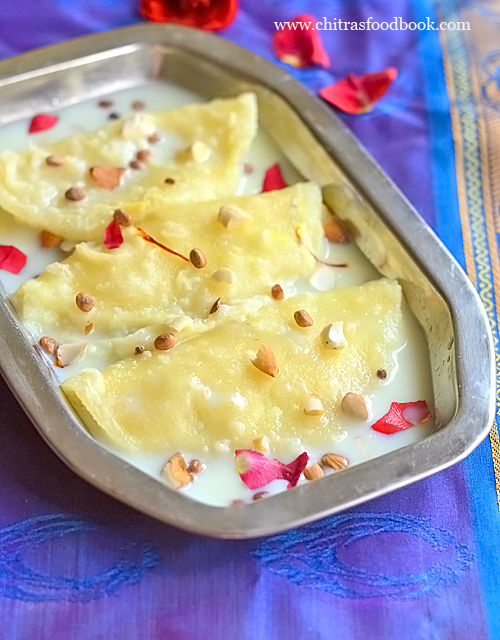 Friends, do try this yummy paal poli recipe for festivals and occasions at home. I am sure your family members would love it. 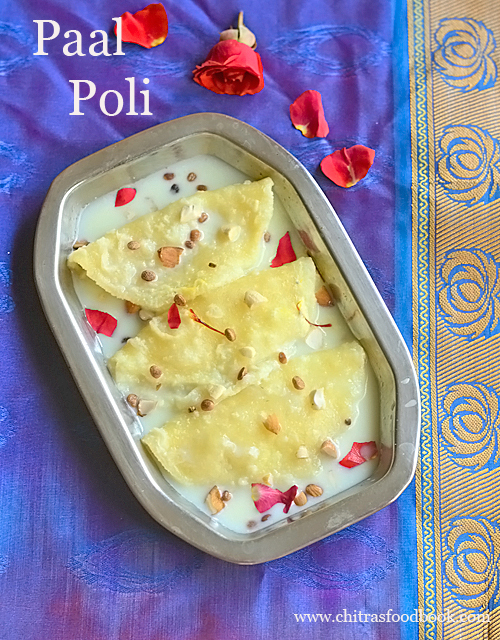 Lets see how to make paal poli recipe with step by step pictures. 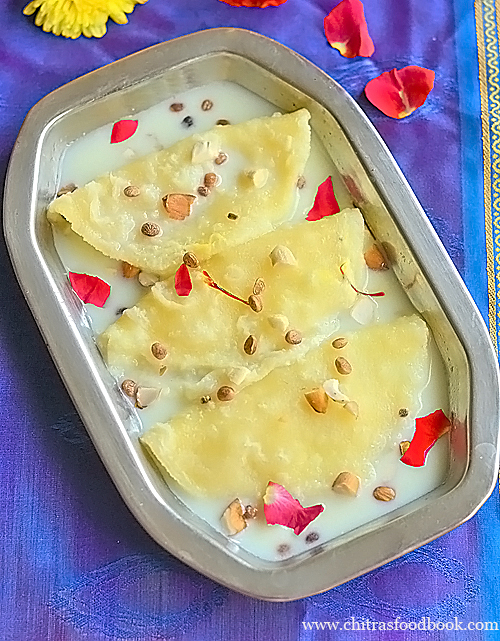 Traditional South Indian dessert recipe - Paal poli prepared using maida poori and sweetened milk. To make paal poli, take maida, rava, ghee and salt in a bowl. Mix well. Add water gradually and make a smooth, non-sticky, stiff dough. Let the dough rest for 15 minutes. Cover and keep it aside. In the mean time boil milk. Boil till its reduced slightly. Add sugar, cardamom powder and chopped nuts. Mix well and switch off the flame. After 15 minutes, take the dough. Knead well. Roll thick, small poori by dusting in maida. Heat oil in a kadai. Deep fry poori both the sides. Do not over fry like papad. Remove the poori, drain the oil and add to milk. In a wide bowl, take maida, rava, salt and ghee. Mix well to spread ghee in the flour. Add water gradually and make a smooth, non-sticky, tight dough. Knead for few minutes. Cover and rest for 15 minutes to 30 minutes. In the mean time boil milk in a pan. 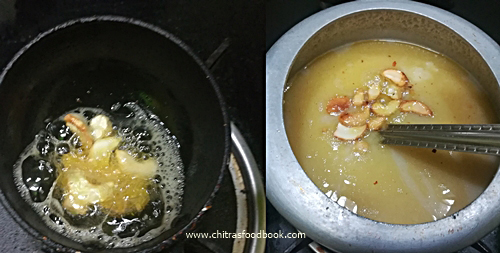 When its quantity is reduced slightly, add sugar, chopped nuts and saffron. Boil till sugar melts and switch off the flame. Add a pinch of powdered edible camphor for nice flavor. Its optional though. Take the dough and knead for a minute. Make lemon sized balls. Dust it with maida if needed. Roll into thick, small poori. Heat oil to deep fry. Check oil temperature by dropping a pinch of dough. If it rises to the top immediately, its heated. Drop one poori and pat it gently. It will puff up and comes to top. Flip and cook the other side. Remove and drain the oil. You can fold into half moon shape if you wish. Dunk the poori in milk and set aside to soak for 30 minutes. Serve warm or cold. Garnish with more nuts and saffron if you like. Do not add more rava. It makes the poori hard. Do not over fry the poori. It will become a papad. Try this yummy, delicious paal poori and enjoy. 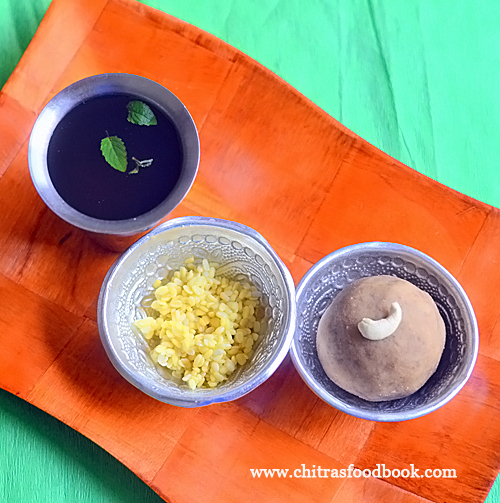 Vadapappu, Chalimidi and Panakam are the 3 most popular and quick and easy naivedyam recipes of Andhra. 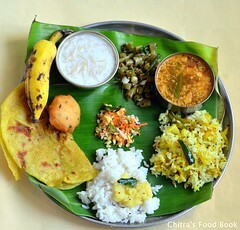 It is usually prepared for Ramanavami , Varalakshmi vratham and on the first day of Navratri. All these 3 prasdams can be prepared under 10 minutes. Chalimidi is of two types. One is pachi chalimidi is an uncooked version which is made of rice flour and powdered jaggery. Second one is Pakkam chalimidi in which rice flour is cooked in jaggery syrup. In Tamil, it is called as Maavilakku. Today I have shared Pachi chalimidi recipe. Traditionally chalimidi is prepared using homemade processed rice flour. But today I have shared a quick version using store bought rice flour/Idiyappam flour. 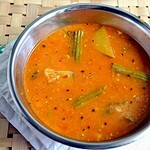 Vadapappu is also an easy, one ingredient naivedayam recipe prepared by soaking moong dal. It is similar to Karnataka's Kosambari. Panakam is a sweet drink and a summer coolant that is prepared by mixing jaggery, dry ginger powder, pepper powder in water. Friends, do try these 3 easy, yummy Andhra special naivedayam recipes for festivals and offer to God. To make Chalimidi, take the rice flour, jaggery, ghee, cardamom powder in a bowl. Mix well. Add little water if needed and make a non-sticky ball. Pachi Chalimidi is ready. To make vadapappu, wash and soak moong dal in water for 1 hour. Drain the water completely and offer to God. 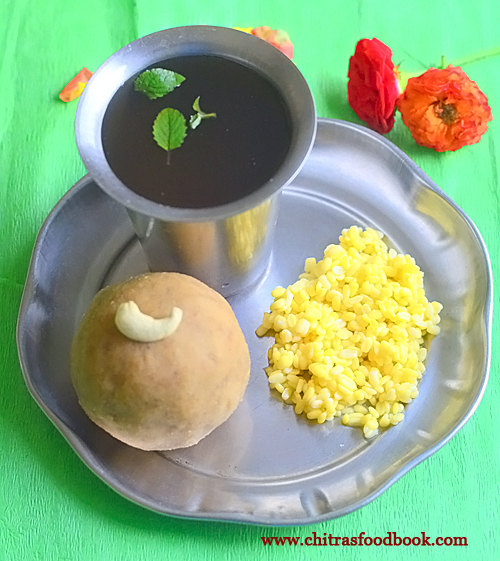 For panakam preparation, mix jaggery and other ingredients in water. Filter the water. Panakam is ready. 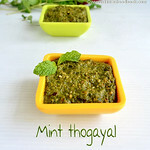 Garnish with few tulsi leaves and offer to God on Ramanavami and other festivals. How to make pachi chalimidi : Take store bought idiyappam/ appam flour in a bowl. Add powdered jaggery ( I used organic brown sugar/Naatu sakkarai, so its color is too dark), cardamom powder, ghee. Mix well. 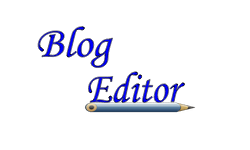 Add 1 to 2 tbsp. water. Mix well and make a smooth ball. Pachi chalimidi is ready. How to make vadapappu : In a bowl, take the moong dal. Wash and soak in enough water for an hour. Drain the water completely and take the soaked, wet moong dal. Offer to God. How to make panakam: Take one cup of water. Add powdered jaggery, cardamom powder, dry ginger powder and pepper powder. Mix well and strain it. Garnish with few Tulsi leaves. Panakam is ready to serve. Enjoy ! Adjust the quantity of jaggery in chalimidi and panakam based on your taste. 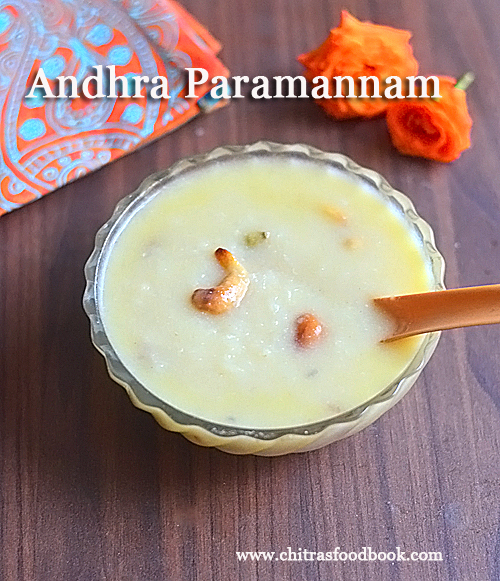 3 easy and yummy Andhra special naivedyam recipes are ready ! 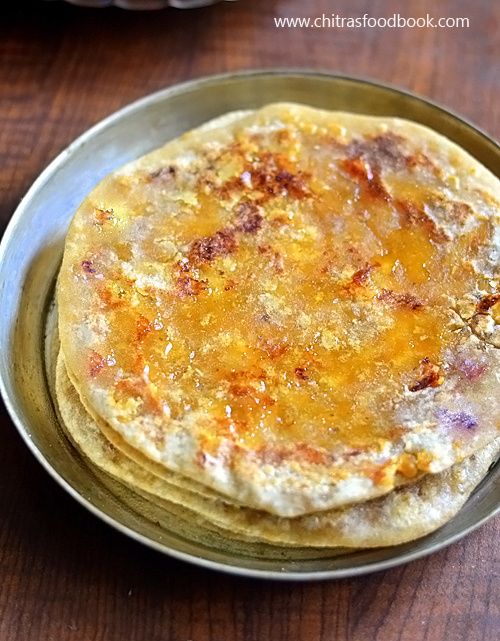 Puran poli with wheat flour / wheat flour obbattu – Recipe with step by step pictures. Puran poli a popular festival sweet in Maharashtra. 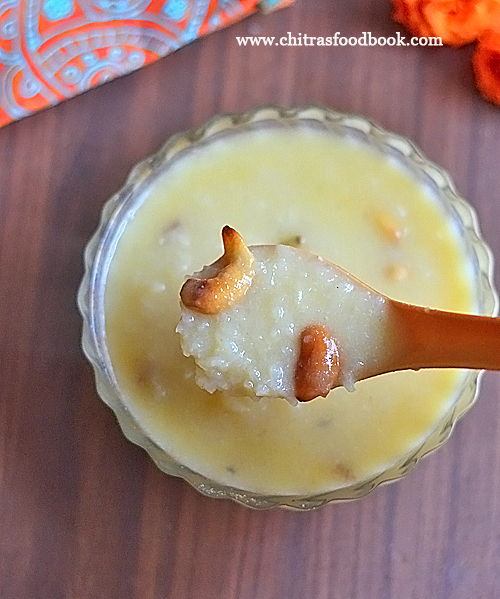 This sweet recipe is called by various names across India. They have small variations in ingredients and method of preparation. In Tamil, we call it as paruppu boli. 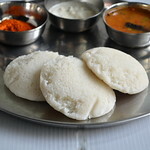 In Kannada, its is obbattu / holige and Bobbatlu/ bobbattu in Telugu. After Ganesh chaturthi celebration, many of us must be thinking of using leftover chana dal pooranam that is prepared for kozhukattai / modak. Every year I make suzhiyan / susiyam using the leftover stuffing. So this year I prepared puran poli with wheat flour instead of maida for outer covering. It came out well and soft. 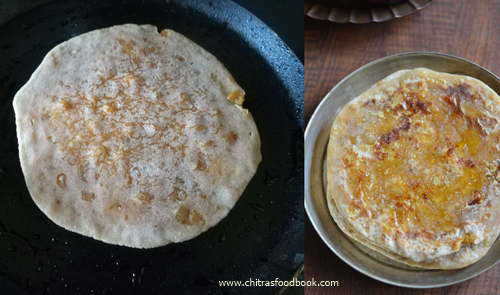 To make soft puran poli, I followed my chapathi / roti recipe adding ghee and curd to make the dough. I rested the dough for 30 minutes and tried it. As I had already prepared Karnataka style obbattu/ holige, I followed the same steps and procedure for stuffing and rolling the puran poli. It came out so good. Myself and Sendhil liked it very much and had the same for our breakfast. I had a satisfaction of making obbattu without maida adding less oil/ ghee. 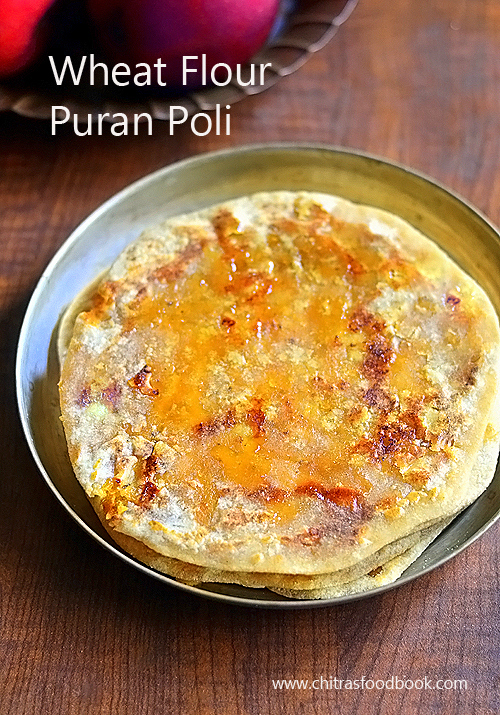 Friends, If you have leftover pooranam/ Hooran/ stuffing prepared for the festival, you can make this puran poli recipe with wheat flour. You can make this poli thin or thick as you wish. Check out my Karnataka style holige / Obbattu recipe with tips and tricks. Wash and pressure cook chana dal in required water till soft. Remove and drain the excess water. Mash or grind it coarsely. Melt jaggery adding water. Strain the syrup. Add chana dal paste. Add grated coconut, cardamom powder. Mix till thick like dough. Puran is ready. Knead smooth dough with ingredients given above. Make equal balls of puran and dough. Dust the dough ball with wheat flour. Roll it and keep the puran balls. Seal and roll it thin or thick. 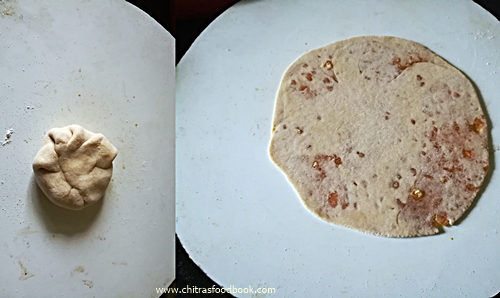 Heat dosa pan with oil. Cook the puran poli both the sides. Remove and serve hot adding ghee on top. Prepare the stuffing / pooranam first. For this, pressure cook channa dal adding required water and a tsp of oil.Cook for 2-3 whistles in low flame. After the steam is released , mash the dal well with a ladle or grind it coarsely without water. Set aside. To this mashed dal , add grated coconut and jaggery. Mix till the mixture thickens and leave the sides of the pan & becomes non-sticky. Add cardamom powder. (If jaggery has impurities, boil and melt jaggery in little water Add this syrup to the cooked chana dal and cook till thick.) Switch off the flame and allow it to cool. Make small lemon sized balls after the stuffing becomes warm. (TIP : If the pooran / Stuffing becomes watery and not thickens soon, you can add some besan flour ( say 1 to 2 tbsp) , mix without lumps and cook in medium flame till thick. Besan helps to thicken the stuffing soon.). Refrigerate the leftover stuffing till use. In a wide bowl, take the wheat flour, ghee, curd and salt. Mix well. Then add water gradually and make a smooth, non-sticky dough. Cover and let it rest for minimum 30 minutes. Take the dough after resting time. Make balls equal to or little lesser than the size of puran ball. Take one dough ball. Dust it with wheat flour or grease with oil. Roll it to palm size. Now place the stuffing ball in the middle. Seal the corners and flatten it slightly. Dust it again. Roll it gently to make a thick or thin puran poli. Arrange in a plate. Similarly make the remaining poli and arrange them without touching each other. Heat a dosa pan. Grease with oil or ghee. Drop the poli and cook till brown spots appear on one side. Flip and cook the puran poli on other side too. Cook in medium flame patiently. Add ghee or oil if needed. Remove and arrange in a plate. Apply ghee on top to prevent drying. Cook the remaining poli and stack them one above the other to keep it soft. Enjoy hot or warm ! Store the leftover stuffing and dough in refrigerator. 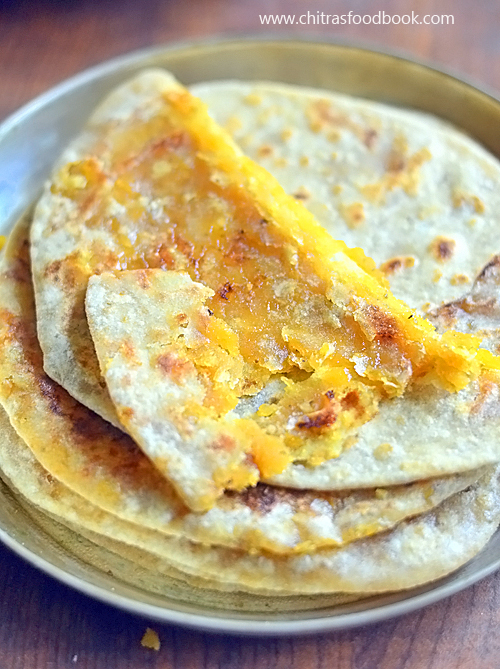 To make soft puran poli with wheat flour, you must add ghee or oil in the chapathi dough. Dough should be rested well to make soft obbattu. You can rest it for 30 minutes to 3 hours. If the puran / stuffing is watery and not thickening soon, you can add some besan flour and cook till it thickens. If the dough is too sticky, grease your hands with oil and roll the poli by patting it on a butter paper. If its non-sticky, you can dust in wheat flour and roll in a rolling pin. Always cook the poli in medium flame patiently till brown spots appear. Smear with ghee or oil whenever needed. Stack the cooked poli one above the other to keep it soft. Ghee helps to make the puran poli softer. But if you are health conscious, you can use gingely oil. 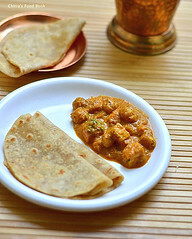 Try this yummy puran poli recipe with wheat flour and enjoy ! In Tamilnadu, people make Sakkarai pongal and kondakadalai sundal for Varalakshmi pooja, Ganesh Chaturthi, Tamil new year and Navarathri festival. We make this sundal with white chana or brown chana. 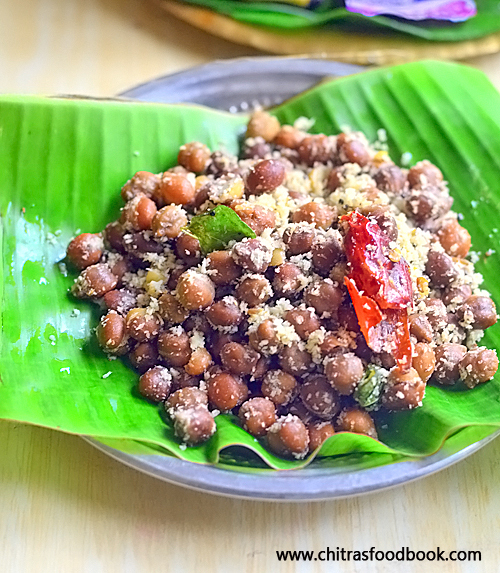 My MIL usually says it is auspicious to make black chana sundal( i.e Kala chana in Hindi, Black chickpeas sundal in English, Karuppu Konda kadalai sundal in Tamil) during festival days. Yesterday I prepared Sakkarai pongal and brown chana sundal for Varalakshmi vratham prasadam. Usually I make sundal in a simple way by grinding coconut, chilli and cumin seeds. I don’t ad any masala powder or fennel seeds if making for God. Some people also make this sundal by adding sundal podi. I will try post that version later during Navratri. 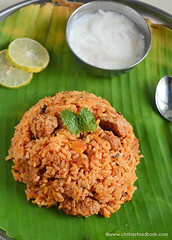 Today lets see an easy method of making brown kondakadalai sundal recipe with step by step pictures. Check out my other sundal recipes. 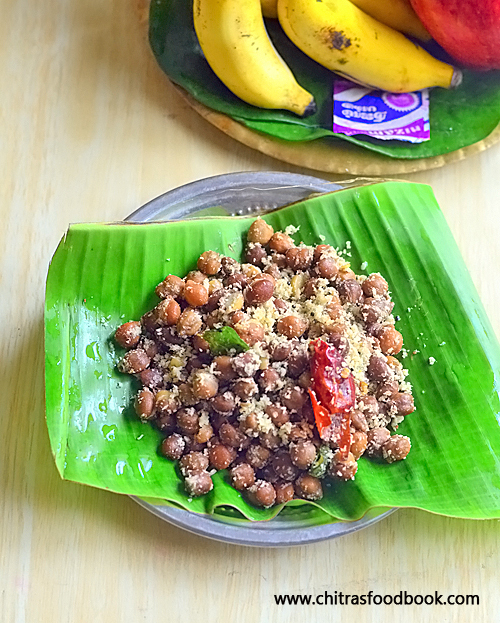 South Indian style kondakadalai sundal recipe for festivals. Wash and soak black chana / kondakadalai overnight or for 6 hours. 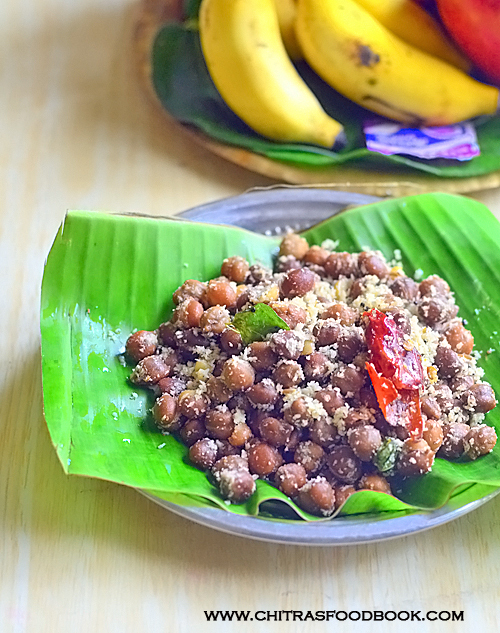 In a pressure cooker, cook the channa till soft adding required water and a pinch of soda. Drain the excess water and set aside. Grind coconut, chilli and cumin seeds without water. Set aside. In a kadai, heat oil. Temper mustard seeds, red chilli, curry leaves and hing. Add the cooked brown chana and salt. Mix well. Add the ground coconut and saute for few minutes. Switch off the flame. You can add some lemon juice if you like. Wash and soak black chana / kondakadalai in enough water for 6 hours to overnight. You can a pinch of cooking soda while soaking for when pressure cooking the chickpeas. After soaking drain the water, take the chickpeas in pressure cooker. Add required water and pressure cook in very low flame for 2 whistles. Remove the chickpeas and drain the cooked water. Grind coconut, green chilli and cumin seeds to a coarse paste without adding water. Set aside. Heat oil in a kadai. Temper mustard seeds, curry leaves, red chilli and hing. Add cooked chana, ground coconut mixture and required salt. Mix well and cook for few minutes in medium flame. Switch off the flame. Add few drops of lemon juice if you like. Serve hot or warm. You can add baking soda to cook the chickpeas really soft. You can skip if you don’t want to use it. For variations, you can saute 2 red chilli or green chilli and add the grated coconut at the end. This is a No grind version. If you want masala flavor, you can grind fennel seeds instead of cumin seeds. You can also add a pinch of garam masala powder for more masala flavor. You can also add onion if you are not offering to God. Try this easy, healthy black chana sundal and enjoy ! 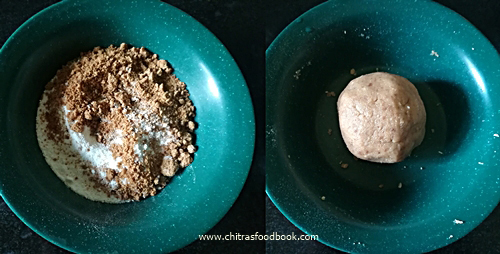 I learnt this easy peanut ladoo with jaggery (Verkadalai vellam laddu in Tamil, Shenga laddu in Kannada) from my friend Shalini. Its just a two ingredients recipe with two step process. She told this laddu recipe is very special among her community people in Andhra (Telugu). There is also a popular snacks shop in Shevapet, Salem that sell this ladoo. My husband Sendhil loves peanut based low calorie snacks like peanut chikki / Kadalai mittai. When I was telling this to my Shalini, she suggested this healthy ladoo recipe with the same combination of peanut and jaggery just like chikki. As we all know peanut and jaggery when eaten together gives us immense health benefits. 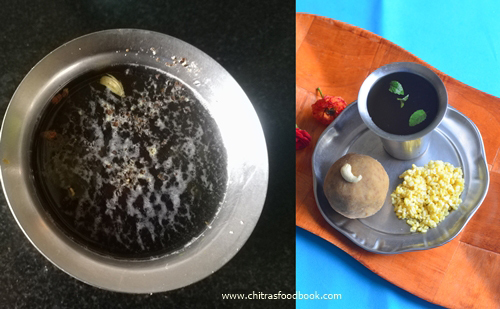 So I was double happy to learn this easy, low calorie peanut laddu recipe without ghee. I made this for my Thursday Guru Pooja neivdeyam. This laddu became a super hit recipe in my house😃. Friends, you too give a try. If you have roasted and deskinned peanuts in hand, you can make this laddu in the next 5 minutes. 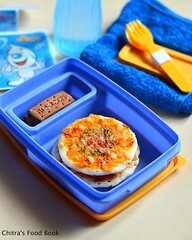 You can also pack it for kids and adults snacks box. This peanut laddu stays good upto one week. So you can make, store and enjoy anytime. 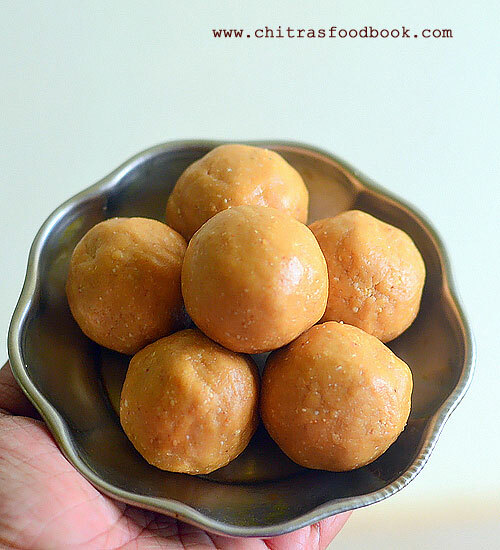 Ok, lets see how to make this simple, easy, yummy and super healthy peanut jaggery ladoo with step by step pictures. 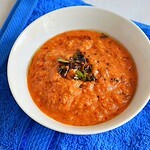 Check out my Peanut chutney recipes in this link. 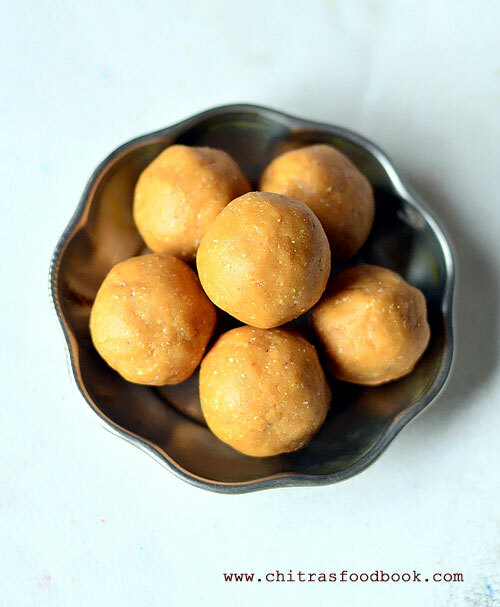 Peanut ladoo with jaggery - Healthy, easy sweet recipe with peanuts. Dry roast the peanuts in a kadai or microwave roast the peanuts for 2 to 3 minutes in high power. Rub the roasted peanuts and remove the skin. In a mixie jar, grind the peanuts coarsely. Add the grated jaggery and grind again to smooth powder. Make balls tightly and store in an air tight jar. Serve and enjoy ! Dry roast the raw peanuts in a kadai. Roast in medium flame till its skin crackles. Switch off the flame and let the peanuts be in the hot kadai. It will become crispy only after it cools down. So wait patiently. Alternatively you can roast the peanuts in microwave oven too. For this, spread the peanuts in a microwave plate. Roast in high power for 2 to 3 minutes. I kept in 800w power for 2 minutes 30 seconds. Switch off the microwave and let the peanuts be inside the hot oven. It will become crispy once it cool down. Now take the roasted peanuts in a small cloth bag(Manja pai) or in a plastic cover. Rub it well to remove the skin. Collect the roasted peanuts in a plate. Grind the roasted peanuts coarsely. Then add the grated jaggery and grind again to smooth powder. Check for taste. Add more jaggery and grind again if needed. Do not grind for long time continuously. Oil releases from the peanuts and becomes like a paste. So just pulse it to mix well. Remove the powder in a plate. Roll tightly and shape into ladoo. Store in an air tight jar and use it within a week. You can add 2 tbsp extra jaggery for more sweetness. Usually the ratio of peanuts and jaggery is 1:1. Ghee is not needed as the oil from peanut helps to shape ladoo. You can add cardamom powder while grinding if you like. 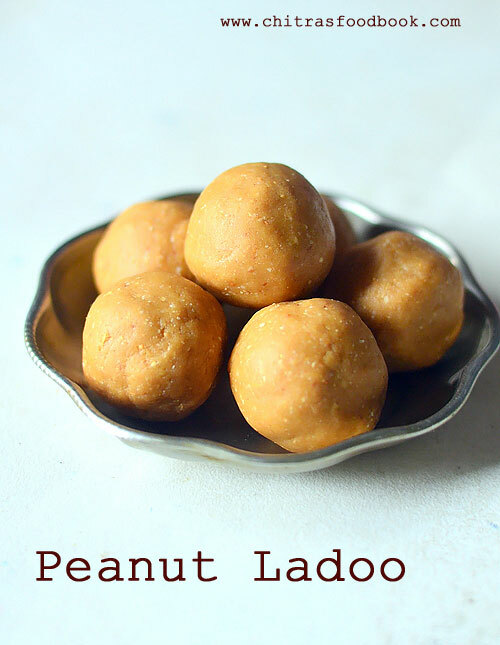 Try this easy, yummy, healthy peanut ladoo for your kids and family. They will love it !